I just had to make a wallie of this image! They all look so cool here. *fangirls* As you can see, it's Matrix-inspired... ^^; Finished this in about 2 1/2 hours. Dozo~! Woah! This is a beautiful fusion of matrix and the bleach! Looks so cooLLL. Thanks for this wallpaper! wow!! it's great!! XD It really looks like matrix!!! XD love it! great job! Awesome, nice idea u had here, fantastic job. actually the matrix movies are my favorite movies. I'll add the wall to my favs. live on!!! Haha... that is cool! I love green on my desktop too, so multiple plus!! Thank for the share +fav ^_^! 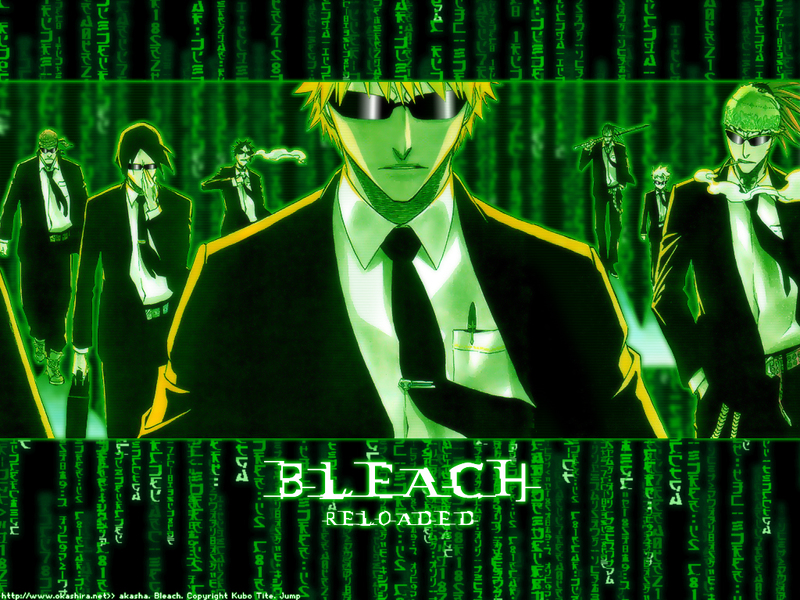 such a cool wallpaper .. i´m a big fan of Bleach! thx for this great wall! Lol, they're all pimpin in suits. Yea, this pic was asking for Matrix treatment. I like it. Thank you and waiting for another nice picture!! OMG! This is really a very cool wallie! They all looked so cool in here, well... I don't know any of the char's names, but... I like it. They've got style and they're all cool, I'll give it a fav! awesome thats a definite fav and i gotta download that and put it on my desktop. Good job!!!! perfect combination! They look here so cool yeah You have right! Wow! This reminds me of the Matrix. This is a great wallie! *adds to Favorites* Me likey!